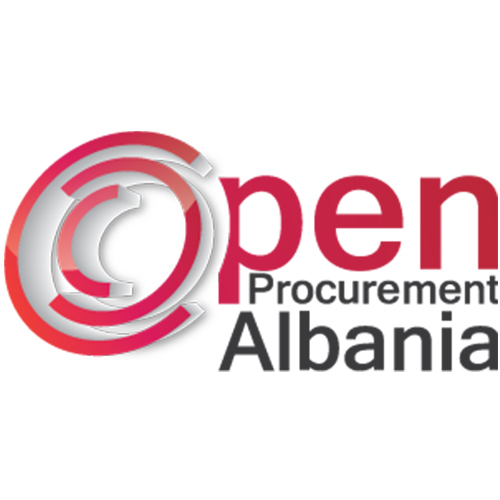 Open Procurement Albania. During 2016, AIS created two new databases with data on Public Procurement and Contracts. The Open Contracting Data Standard was applied for the first time in Albania by a non-Governmental organization. 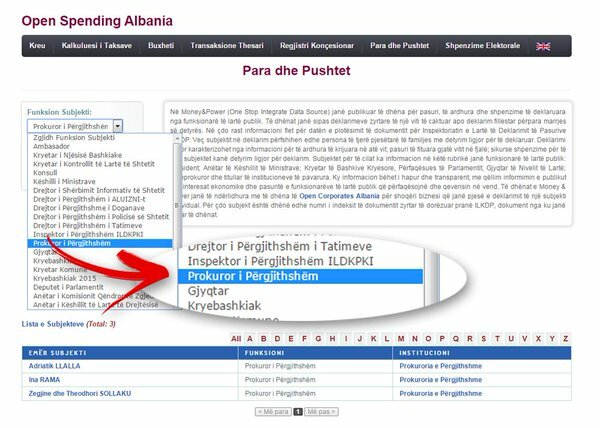 Anyone may find data regarding Public Procurement and Contracts in the Open Procurement Albania portal in real time, including: the name and ID of the Procuring Organization/Buyer; Estimated or Ceiling Value; procurement Method; tender status; number of Bidders; Name and ID of Supplier and Provider; Awarded and Contracted Amount; Planned Milestones of Contract; renewal of Contract; Additional Values; Actual Transaction Expenditures, and other indicators of the procuring and contracting process. The data cover two public sectors, Health and Local Government The data catalogues for 2016 contain information about 5300 public procurement procedures in the Health Sector and 5900 procedures of municipalities. Way forward – 2017: two new catalogues will ensure greater transparency and a watchdog process: Red Flag Index and Open Corporate Albania. A Red Flag Index will be applied to mark the level of exposure of each of the 61 municipalities to risk of abuse and corruption in their tenders. In 2017, AIS will also publish a new catalogue of open data for 3000 companies as successful bidders and contractors of public contracts. The data will shed light on the owners of these companies and any potential connections relevant to their interests. Follow us! In 2016, AIS also provided the Albanian public with open data regarding the state treasury transactions. Access was enabled to every single transaction of every budgetary organization. This includes a total of 245 353 transactions for 1660 budgetary institutions. The data were presented in such a format that they enable search filters by date of payment, value, category of expenditures, beneficiary client, and description of invoice. How much do the state officials, MPs, ministers, Prime Minister, high level judges, and other high officials of our main institutions make? Again, this year, the Money and Power section of Spending Data Albania portal published the annual declarations of assets and incomes. Such data encourage the publication of dozens of articles on the media as part of fact-based journalism. The annual declarations of incomes for the high level state officials are published as part of the activities of the Money, Government and Politics Program. Open Data Albania , the portal which ensures transparency through data, published this year dozens of investigative articles and socio-economic indicators. Gender-disaggregated data on the level of criminality, and data about the market and fiscal policy, were made available to the public both in Albanian and English. Various actors and interest groups refer to this portal as an open and well-structured source of information, which creates knowledge and sheds light on policies that need to be reviewed. Six municipalities applied instruments of financial transparency this year. Under the slogan “Open Government is Good Governance”, USAID Albania, in the framework of its Planning and Local Governance Project PLGP and in cooperation with our organization, the Albanian Institute of Science (AIS), worked in 2016 to enhance the capacities of the employees of the municipalities of Korça, Fieri, Lushnja, Berati, Elbasan, and Kuçova in ensuring financial transparency through ICT tools. Two open data applications for budgeting, Money Mapping and spending Monitoring Treasury, were developed and placed on the official websites of these municipalities. In order to make the municipality employees capable of independently integrating and ensuring budgetary transparency through ICT tools, the project developed several IT tools for transparent spending during 2016. 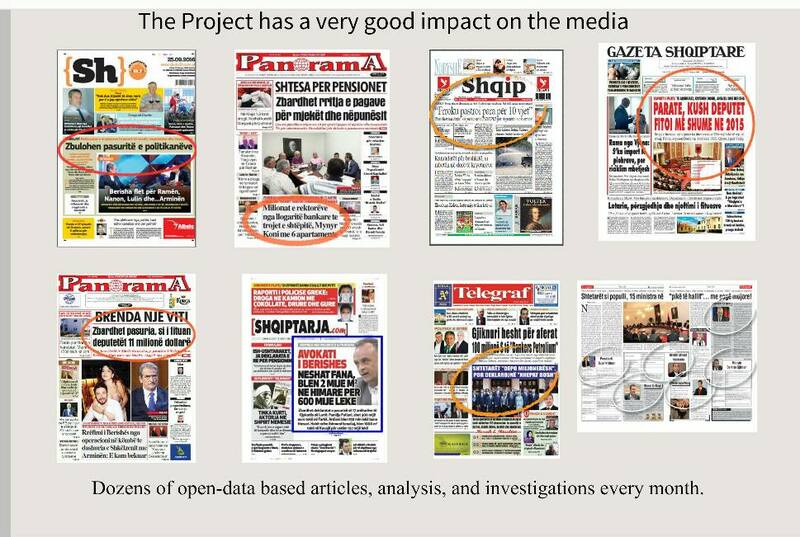 The application of fact and data-based journalism, as well as qualitative reporting through Open Data Journalism, were part of a set of three training courses for the Albanian journalists. The use of databases of open data, the application of linked data as an element that identifies connections of interest, and the application of Google charts and visualizations, were some of the elements applied to increase the capacity of journalists. The process involved a total of 70 journalists during 2016, which was finalized in a network of journalists named Follow the Money. The aim for 2017 is to encourage more fact-based journalism, more transparency, investigation, and media reporting of abusive and corrupt practices. In 2016, AIS addressed the Strasbourg Court, asking it to express its views on the prolonged delays with a case court in the Albanian Court of Appeal. The case consists of a violation of Article 6 and 13 of the European Convention of Human Rights. On 25 November 2015, AIS made an appeal to the administrative Court of Appeal concerning its court case, AIS vs. the three largest political parties in the country, i.e. the Socialist Party, Democratic Party, and the Socialist Movement for Integration. The case is about public information on electoral funds. The adjudication is delayed for more than a year, and there is still no date set for this case to be tried at the Administrative Court of Appeal. Upon a request of AIS, the Albanian Government decided to commit to applying the Open Contracting Data Standard through its two-year action plan for Open Government Partnership. This is the third time that AIS participates in consultations with the Government for the OGP action plan. This time, AIS asked the Government to apply the Open Contracting Standard for all public contracts, a request that was partially taken into consideration in the Government commitment to use such standard only for the Concessionary Register and PPPs. The Albanian Electoral Code must be amended in order to introduce stricter rules regarding the financing of electoral subjects. As part of the Electoral Situation Room, AIS prepared a draft policy paper with recommendations for improving the articles regulating the financing and auditing of electoral campaigns. Such recommendations aim at encouraging control and transparency over electoral donors, better auditing standards for the sources of financing, prevention of the conflict of interest for donors who are consequently awarded public contracts, etc. The draft was submitted to the Parliamentary Committee working on the Electoral Reform. On 9 May 2016, the Constitutional Court abrogated the mandate of Koço Kokëdhima, a Member of Parliament. 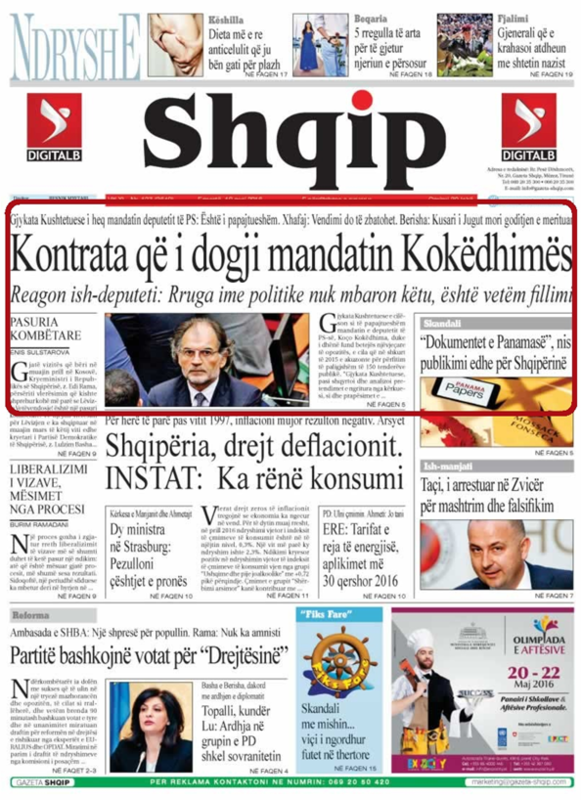 While MPs are not allowed to benefit from contracts and payments using public money, a company established by Kokëdhima had benefitted from more than 200 financial transactions with various public institutions. The data about such transactions were published by AIS’ portal, Spending Data Albania. The publication encouraged public debate and the initiation of a court case. Two years afterwards, the court decided that Koco Kokëdhima should no longer be an MP, and his mandate was therefore revoked. A voice for civil society. This was the slogan of an event held for the first time in Tirana. DiploHack Tirana was organized by the Embassy of the Netherlands in Albania in cooperation with AIS. What happens when a programmer, a civil society representative, and a diplomat solve a problem together?! Thirteen teams composed of a mixture of diplomats, programmers, and civil society representatives worked together on ways to use open data and technology to strengthen civil society advocacy. In the end, the teams presented thirteen applications designed to raise the civil voice. On 19 April, the Open-LGP program published a problematic call for a tender made by a local government unit, Tropoja Municipality, inviting the interested agents to submit offers for renting Valbona tourist center, one of the most visited tourist centers in that area. The center, including the building and the outdoor part, covers an area of 4118 m2. The municipality set a minimum acceptable price of 430 Euro, giving those interested 48 hours to prepare and submit the required documentation. Following the publication of this call, the media investigated the value of the asset, and reported an obvious clientelist and abusive tender. There were also reactions from many citizens on the social networks. This monitoring process and public pressure forced the contracting authority to cancel the plan of renting this public space. Finally, we would like to thank our donors and partners, who enabled the implementation of our programs in 2016: The Embassy of the Kingdom of the Netherlands in Tirana, The US Embassy in Tirana Democracy Commission Small Grants, The National Endowment for Democracy NED, LevizAlbania Local Democracy in Action Program financed by the Swiss Development and Cooperation Agency, USAID through PLGP Program, etc. In addition, we ensure transparency over our expenditures, and the budget of the organization, including the values of grants, donations, and funding of our contracts by publishing such data and making them available on our portal Open Data Albania.